Some months ago we received an email enquiry from Sue Wilmott in Australia. Her great-great-great-greatgrandfather, William Fenning, and his son, also William, were proprietors of the Ravensbury Printworks at the end of the 18th and in the early 19th centuries. 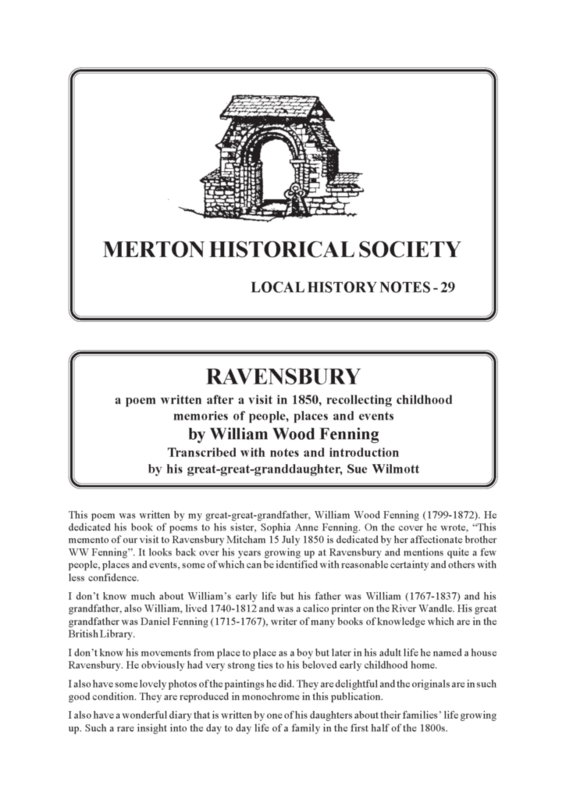 Sue’s great-great-grandfather, William Wood Fenning, revisited Ravensbury in July 1850, probably for the funeral of his sister, and wrote a long poem looking back over his years growing up at Ravensbury and mentioning quite a few people, places and events. Sue has transcribed the poem, and added explanatory notes, and has generously allowed us to publish it in our Local History Notes series. Illustrated with monochrome copies of William Wood Fenning’s watercolours of the area, this booklet adds considerably to our understanding of our locality at this time. Ravensbury. He obviously had very strong ties to his beloved early childhood home. good condition. They are reproduced in monochrome in this publication. up. Such a rare insight into the day to day life of a family in the first half of the 1800s. industry which flourished on the banks of the river Wandle at Mitcham. widow for a year or so, but by 1791 it had become the residence of William Fenning. Its cup of healing to the troubled heart! Seraphic love! – progressing still for ever! “Will ye be absent from our happy throng? And when for brighter worlds they left the earth. What was not sought that healing skill could borrow? In self abandonment, could constant prove? Ease, rest, sleep, health, – all cheerfully forgone! 6 Royal Exchange Fire Insurance Policy 120664 24 March 1791The agent appears to have been Sarah Benton of Mitcham, who also ran a bakery business. Minet 64/180) gives details of Fenning’s works. And o ‘er our fervid path its odours threw. * Every effort has been made to preserve the author’s original idiosyncratic punctuation and paragraph spacing. Nor wish from youth, it had progressed to man. If length of days were so desired a doom! Mingling with his, aye closed her work of care? Absorbed, we listened to the solemn lay. The lesser natures all harmonious move! Each loved remembrance coupled with thy name! The bliss which the Redeemed alone can know! And did he moo and:– how scampered we away! Those verdant meads: a memory to be blessed! For non compliance with the world, its sneer. So he could ornament his Master ‘s cross. A marble eulogy than his less vain. How his afflicted son could be beloved. The obsequious incense of some London fane? Why did he not some rustic pulpit sway? And to his death, unbeneficed was he. Independence. He was living at Ravensbury House in 1779. Where hopes had promised, only to deceive. In those young days than now when growing old? O’er the bright river as it murmured by? And the sad parting difficult to bear? Or to dispel, or share with us the sigh? Lent to uphold us in our destinies! And echo with her loving words again? As wayward dotage called her to its side? She smoothed his couch, and cheered his languid eye? “But were you now an angel. Yes? or No? Like most of our good tars – and kind, and true. And that bright girl, o ‘er village belles – the queen. Smack over much of fashionable squares. Sir Hildebrand – maybe Sir Hildebrand Oakes (1754-1822) Lieutenant General1st Baronet. Barter our Gospel freedom for her chain. Of Rutter ‘s mixture in the passing breeze. Their otto widely with the morning ‘s dew. To us as children was the abode of care! Whose mill at dawn should be a solitude. growing and distilling of medicinal and aromatic herbs. powered practice on the Wandle. And in a fortnight had compressed the tide. Were heard resounding till the evening ‘s close! Toasted long time his venerated name. Intent, next day, the visit to renew. What British volunteers could really do. Half smiling sat; and her swift needle plied. Oft in the nursery quelled the rising jar. Had come to tempt the troutlings; but alas! Was known to vex the Wandle ‘s finny store. And puzzled legal brains ( ’tis said) profound. made his dish – caught a fish (i.e. To us, more precious than the starry vest. Where ‘er the future called him, to excel. With them again to journey and to die. Commissioner, Scinde (now the province of Sind in Pakistan). Part of his job would be to maintain peace and order. The prophet Daniel ‘s venerated name. But William still believes – it was – her rod. That brought another urchin to disgrace. Thy sympathising tenderness still true! Through thrice ten chilling years yet burns the same. sister – Sophia Anne Fenning, to whom he left this book of poems. Sophia ‘s dip, was aye, our laughing theme. To pounce upon him as he whistled by. That made the sturdy soldier pensive then? From youth to manhood ‘s memory retraced? Scorned by the most, and practised by the few? And be the Cross ‘s faithful champion still? Henry were both soldiers in India. scant – limited, barely adequate. This entry was posted in Publications, Local History Notes and tagged in lhn, mitcham, printers, ravensbury, Reminiscences, textile, victorian mitcham.